BGSL is organized into 5 Divisions - 2 instructional and 3 competitive. The instructional divisions also "compete" but the emphasis is weighted more toward learning the game, and rules are modified for reasonable game length and to keep the girls from getting bored. There are limits to which division a girl can play in based birth year. Girls can "play up" based on ability and comfort zone, but Girls who are too old for a division can't "play down". Don't worry if you've never played, we have newbies at all levels, they end up getting a lot of support from the girls who have played. A players age is determined by the age they are on 12/31 of the year before the registration year. So for a 2018 season, a girl who turns 8 on January 14th is league age 7 - because on 12/31/17 she was 7 years old. 8U/5-6-7: This is for players ages 5-7 (league age). Coaches pitch to players or the ball is hit off of a tee - whichever is more likely to allow the player to hit. Eleven inch "inside" balls are used to prevent injury. Games are limited to around an hour. 10U/8-9 3/4: For players 8-9 (league age). Players pitch, at a count of 4 balls a coach steps in for the pitcher. The intermediates play with amended rules, including a starting pitch count of 1 ball and 1 strike. The rules are intended to encourage the girls to swing and hit, not just wait for an inevitable walk. The game is also measurably sped up, keeping the girls moving as much as possible and dandelion farming to a minimum. games are limited to 90 minutes. As of the 2017 seaason, 10U teams travel and host other towns in the league. Rules options may be adopted per game by coaches agreement. Playing up: For some of the girls, playing in a division above their age is appropriate. If you think your player is one of those, register in the age-appropriate division and then send an email to with your play-up request. When you are thinking of having your daughter play up, also remember that she may be moving out of the group of girls she goes to school with. If a girl is registered as a Beginner and plays up to Intermediates, an additional $20 fee is assessed (to meet the non-beginners price). Teams travel and play other town teams at this level, games start to get more competitive, there are playoffs culminating in a Souhegan Valley Championship game. The 12U Majors/Minors division is for Girls league age 10-12. 12U Minor: No coach pitching, girls can steal, there are up to 6 innings played, rules are mostly Babe Ruth standard. balls are 11", pitching distance is 35 feet. Games are limited to around 2 hours. Players who turn 10 by April 1 are usually moved up to this division. This is the year when we see the most improvement from opening day to playoffs, as girls start to figure out the game and grow into their athletic abilities. 12U Major: This is the first level where Girls are likely to encounter fast pitching. Sliding is introduced, as well as more advanced hitting techniques, stealing, stealing home. Games are limited to around 2 hours. Juniors (16U): For Girls age 13-16 More like competitive softball that you would see being played at the Middle/High School level. 16U also encompasses 14U. Rules are amended by Souhegan Valley local rules, determined by representatives of the towns in the league. One that comes up often is "The Mercy Rule". In NHIAA and Middle School, if a team is ahead by 10 or more runs after a game has become regulation the team ahead is awarded the win. In SV league there is no 10 run rule, instead there are per-inning run limits. The intent is to keep the girls playing for the whole game. When it's obvious that a team is overmatched, the other coach will usually switch pitchers or use other methods to keep from running up a score. 5 run per inning limits are used for all SV games. There is no "continuation rule" in SV. With a continuation rule, if 4 runs have scored and a player hits a grand slam a side could score 8 runs - 3 runs past the limit. The problem with the continuation rule is that coaches would hold runners at third to load up bases to game the extra runs, and when the potential grand-slam comes to the plate they would be intentionally walked to keep the last 3 runs off the board. It's better to allow the batter to hit away, so we dumped the rule. Innings for pitchers are limited - this gets more girls involved in pitching, and eliminates some of the advantage a team has when they have a pitcher that nobody can hit. Beginners have one weekday practice and one Saturday Morning game a week. Intermediates have one weekday practice and one or two games, usually at Selvoski Field - a Saturday game and one during the week. 12U and up have 2 games weekly, either at Selvoski or West field, or away at another Souhegan Valley town. 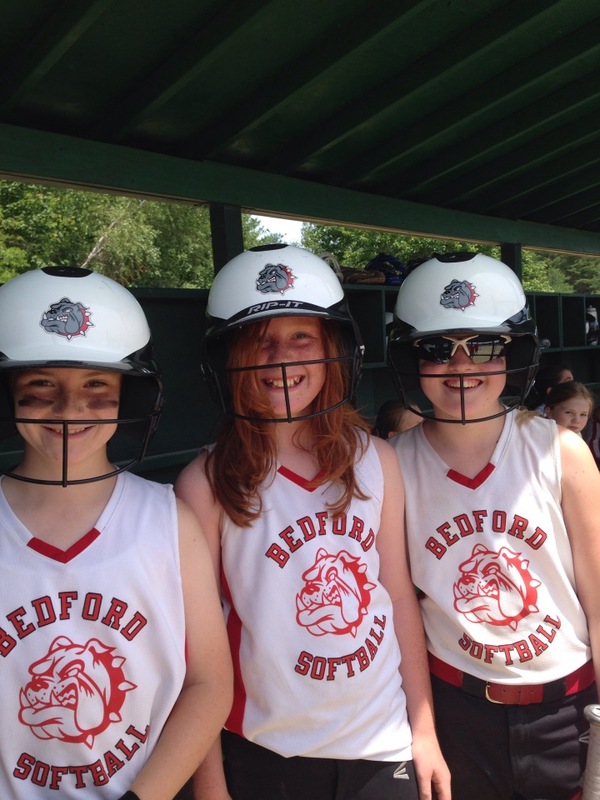 The Babe Ruth All-Stars program is available for Girls league age 6 through 14. Team selections start in the Fall and teams are finalized near the end of the Spring season.